Home > OPEC > Is U.S. Oil Inventory Drawdown Sustainable? 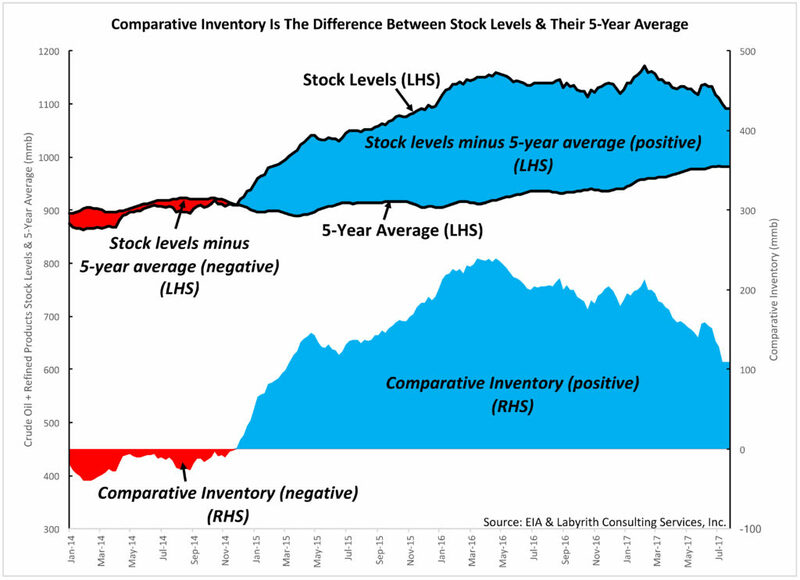 Is U.S. Oil Inventory Drawdown Sustainable? Figure 2. Strong correlation between Comparative Inventory and WTI Prices. Source: EIA and Labyrinth Consulting Services, Inc. 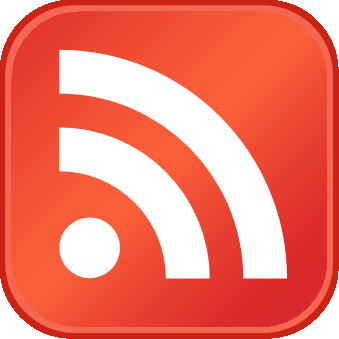 The yield curve does not provide a precise solution to comparative inventory vs. price trends. Nor does it represent a simple regression fit although the data correlate systematically in time. 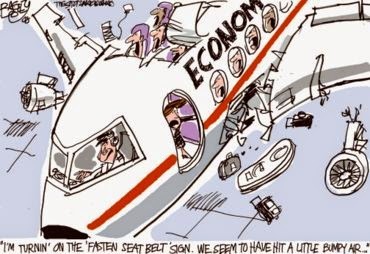 Interpretation based on experience is required because much of the apparent data scatter is due to sentiment-based fluctuations in price. Nevertheless, the C.I. vs. price yield curve presents a unique framework and context for prices and price trends. 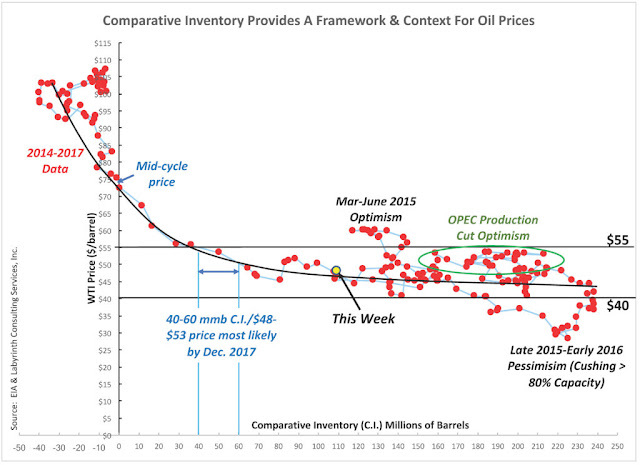 Because it reflects movement of oil volumes in and out of storage, it integrates true demand and supply variations with price. It also places probabilistic constraints on future price movements. 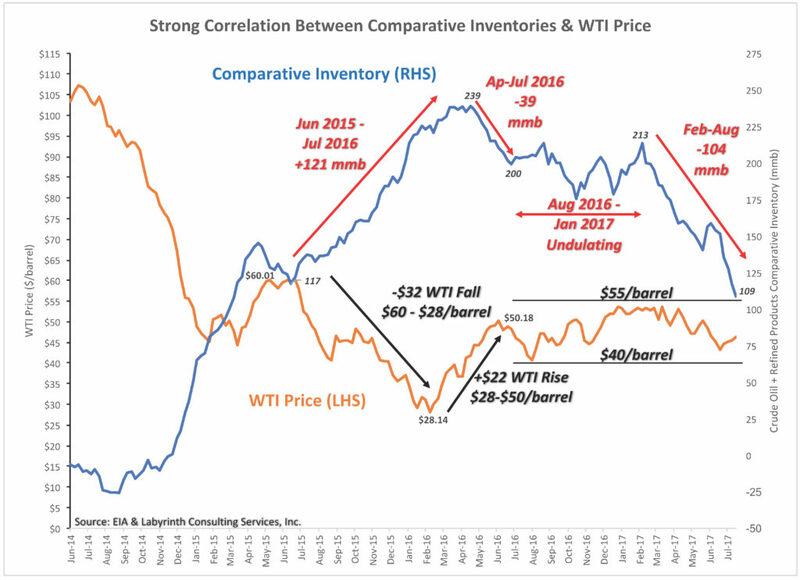 Similarly, the price collapse to less than $30 per barrel in late 2015-early 2016 represented a substantial under-shoot. Yet, it corresponded to the second phase of the largest increase in comparative inventory in history (Figure 2). Cushing storage capacity was greater than 80% during that period and it is a factor that generally puts downward pressure on prices. Figure 5. 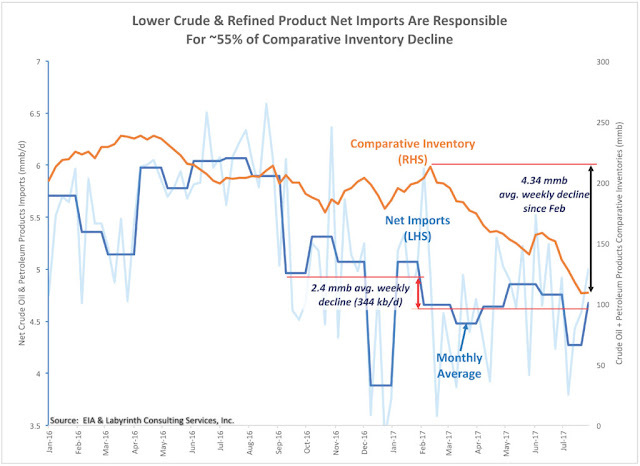 Lower Crude & Refined Product Net Imports Are Responsible For ~55% of Comparative Inventory Decline. Source: EIA and Labyrinth Consulting Services, Inc.
That translates to 2.4 mmb/week or about 55% of the average C.I. decline of 4.34 mmb/week. Lower crude oil net imports account for about 65% of that total decrease. Year-to-date crude exports have averaged 757 kb/d compared to 445 kb/d in 2016. Figure 6. 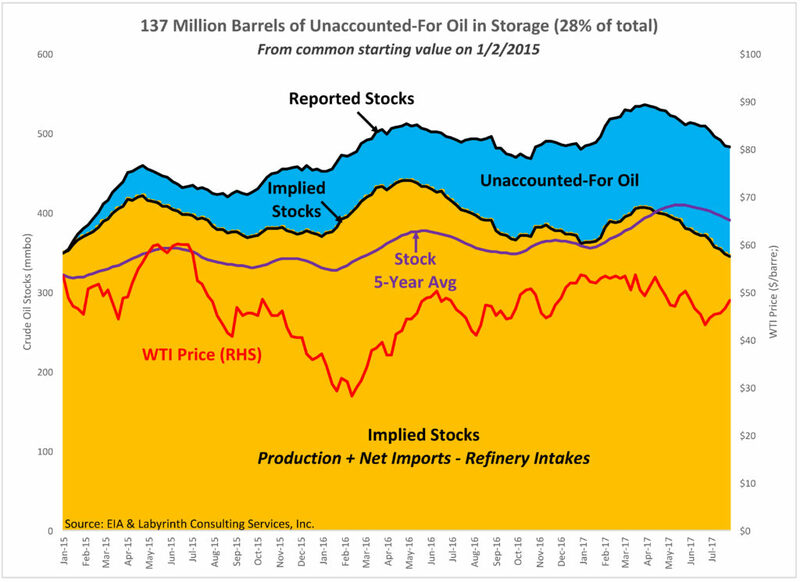 137 Million Barrels of Unaccounted-For Oil in Storage (28% of total). Source: EIA and Labyrinth Consulting Services, Inc. Meanwhile, the outlook for meaningful reductions in world over-supply seems questionable. OPEC’s output jumped almost 1 mmb/d above its target in July. 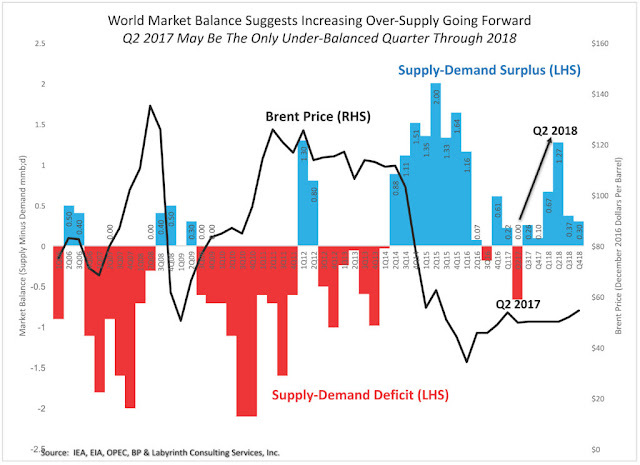 Wood Mackenzie anticipates that global supply may increase almost 2 mmb/d in 2018 if the agreement does not hold. Figure 7 is a synthesis of supply-production and demand-consumption data from the principal international reporting organizations. It suggests that the world supply surplus is likely to increase during the rest of 2017 and the first half of 2018. 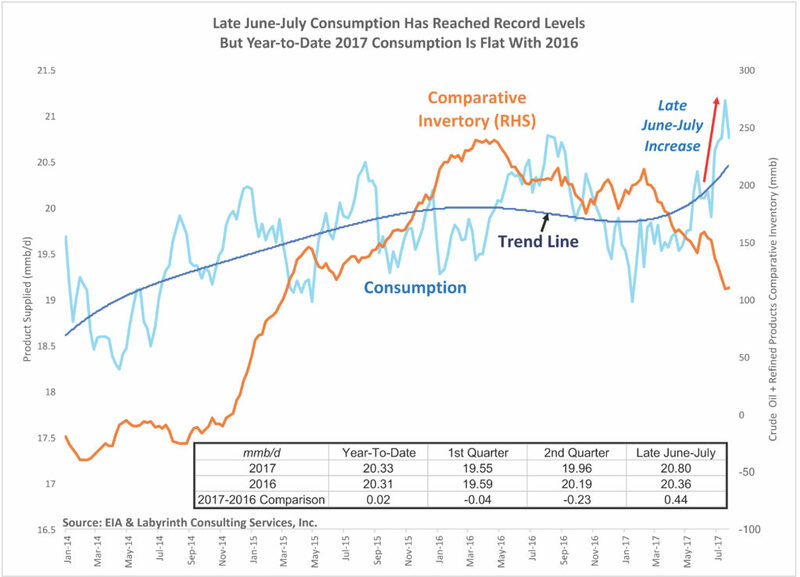 It further indicates that the second quarter of 2017 may be the only period of supply deficit for the next 17 months—that the last quarter was as good as it gets for quite awhile. 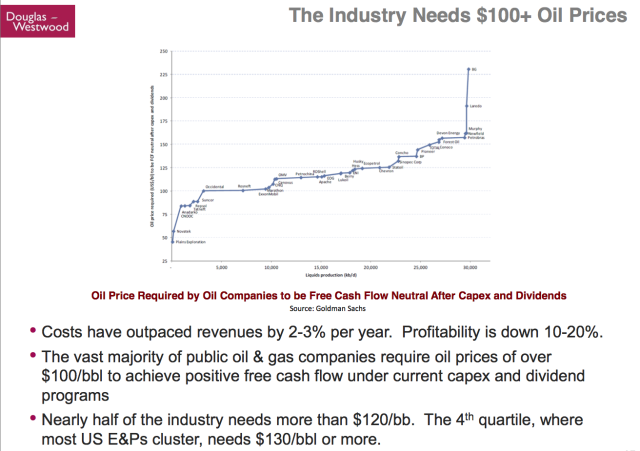 IEA, EIA, OPEC, BP and Labyrinth Consulting Services, Inc.